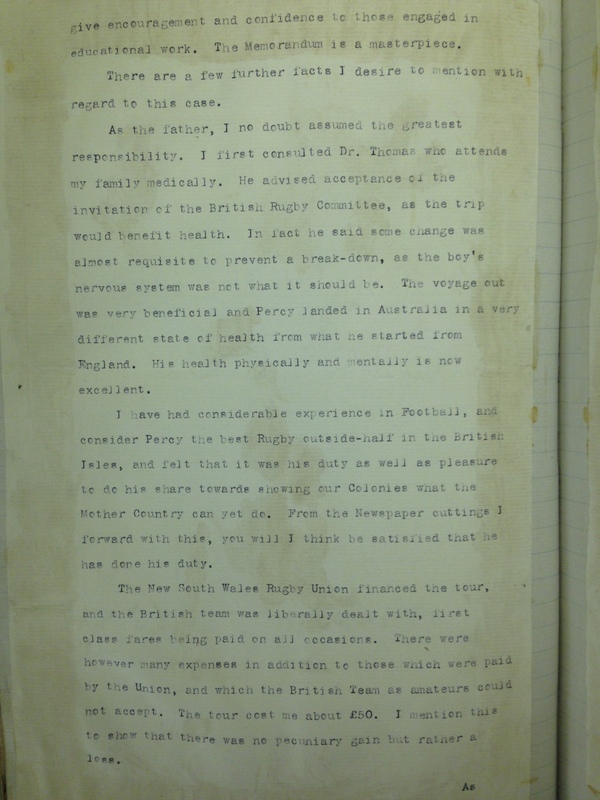 In a meeting on Monday morning I mentioned the delight of serendipitous finds in archives; how you can often just pull something off the shelves and discover an intriguing story or fact. I hadn’t realised it then but, by a strange coincidence, that is exactly what happened to me earlier in the day when I had a few spare minutes in the Archives store. I noticed an early 20th century minute book from the Teacher Training Department of the University College of South Wales and Monmouthshire (now Cardiff University) and had a quick look through it to see what sort of information it held. 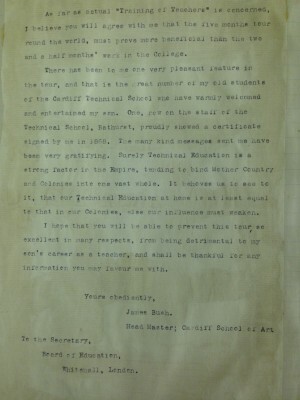 There was a typescript letter stuck into the volume from the father of a student to the Board of Education in Whitehall asking for special consideration for his son’s return to the College. 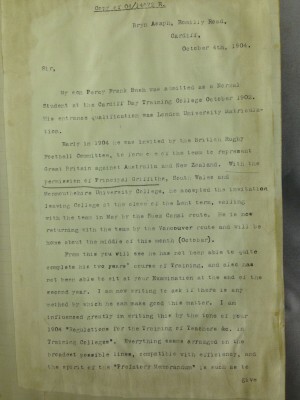 Apparently Percy had been away on a rugby tour of Australia and New Zealand for several months – in 1904 of course they had to spend weeks travelling by sea. 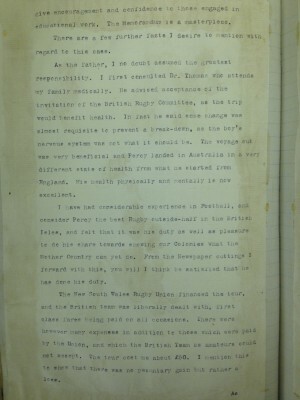 The letter explains that the family doctor had recommended the tour because “[Percy’s] nervous system was not what it should be”. He was now quite recovered, however, and able to pick up his studies again. I thought this was a good example of the kind of information recorded in the minutes so took a couple of photos of the letter. 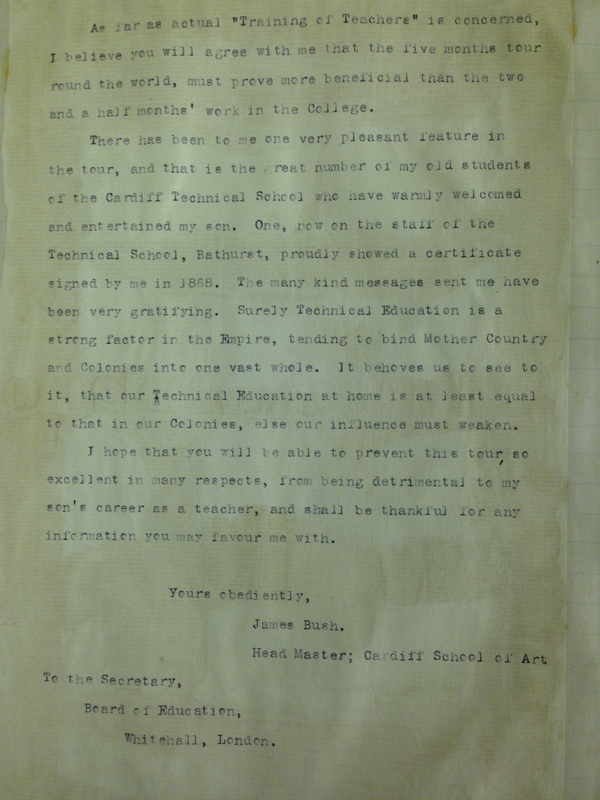 When I looked at it in more detail later on I realised that the father was James Bush, the founder and headmaster of the School of Art in Cardiff (later part of Cardiff Technical School/College, one of Cardiff University’s predecessor institutions). I did a Google search for James’ son and discovered that Percy Frank Bush was an internationally renowned rugby player and cricketer. He played rugby for Cardiff (very successfully) and cricket for Glamorgan (a little less successfully). 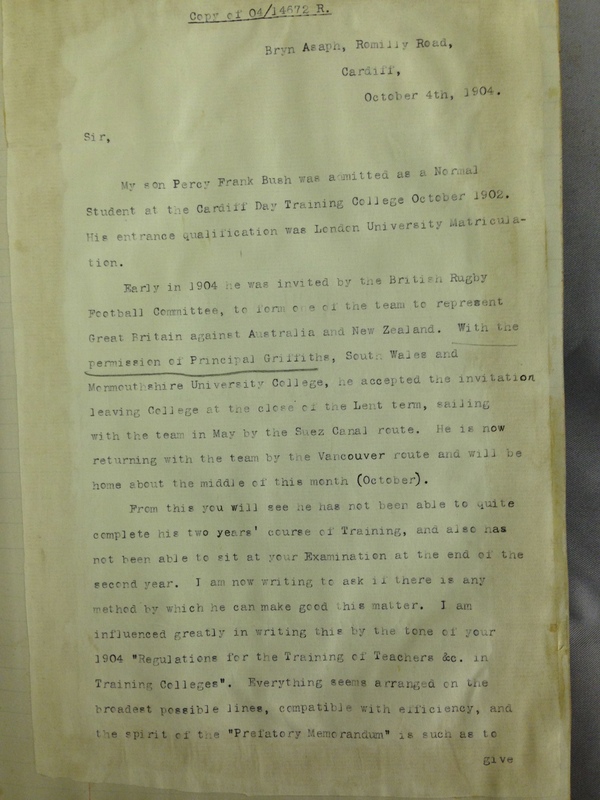 This letter – read completely by chance – adds to our understanding of Percy’s life and provides a poignant background to his glittering sporting career. Despite his outstanding success on the rugby field he struggled with his health and his education for a time before going on to work as a teacher at Wood Street School in Cardiff. It shows how valuable it can be to simply browse through primary sources without any particular aim or purpose. Having the time to do this in a world of pressure may be a luxury but the spare 5 minutes I had this morning brought to light a very human story. Even records that are catalogued can’t all be fully indexed and a lot of information is only found by painstakingly plodding through – or randomly opening! – a volume or a box. In a world where so much is indexed or discoverable by a Google search, it’s good to know there is still plenty left to reveal! 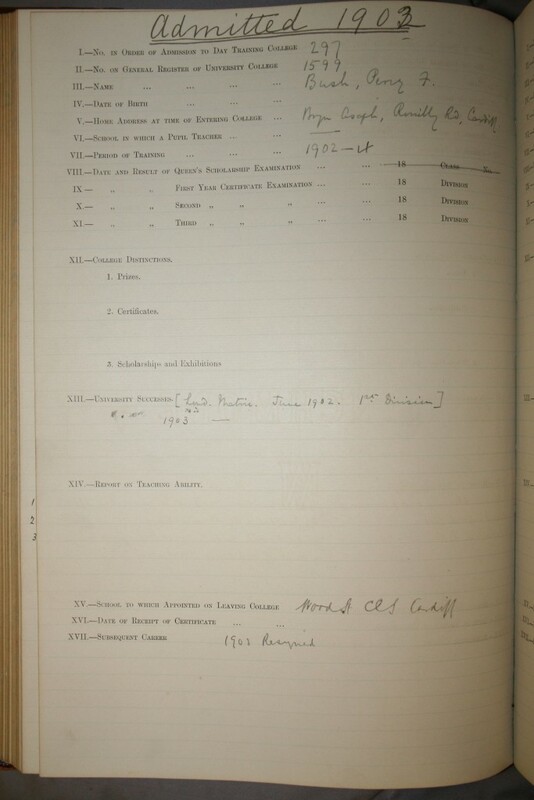 Percy Bush’s entry in the General Register of Men Students No 1 – Normal Department [Ref. : UCC/R/AC/REG/DTC/1].